Background and Purpose: Bruchidius villosus feeding in seed of Laburnum anagyroides, and Bruchidius terrenus seed pest of Albizia julibrissin are first recorded and completely new seed-beetle to Serbian Bruchinae fauna. This Chrysomelids which were found in Republic of Serbia during intensive studies from 2012 to 2014 are likely related to a mostly Paleotropical group, including also members of genera Bruchidius, Megabruchidius and Acanthoscellides. These seed-beetles develop in pods of these two woody legumes, widely grown ornamental trees and shrubs. Several recent reports reveal that this species are well established in France, Hungary, and Bulgaria. Materials and Methods: Bruchine and their legume hosts were observed by extensive field sampling throughout Serbia over three years and by rearing the beetles from the samples in the laboratory. Bruchines and the parasitoids were mass-reared in climate controled rooms under conditions close to those of their area of origin: 12:12 L:D, 3-23°C and ≤80% RH (depends of host plant ongoing phenology or experimental needs-proof of weevil monophagous feeding preferences). For the purpose of analyzing the observed phenomena (its intensity and relevance), some of the standard methods of statistical analysis and conclusion have been used. Results: Levels of seeds infestation still in the pods were high and comparable to other studies. Bruchine beetle infestation in the dehiscent fruits of host plants may be greater after the seeds and pods drop to the ground, as bivoltine generation occurs, but this has yet to be tested. Hypotheses on the geographic origin of this new species are also discussed. The effect of native parasitoids occurrence could potentially be interesting, given that their appearance suggest their specialization on the Bruchidius beetle species which is a common seed-predator on the leguminous seeds. Conclusions: The establishment of this new species is investigated using both morphological data and idioecological analyses. For this purpose, a methodology was developed to assess weevil field densities in a natural environment. However, this needs to be more carefully tested with a larger sample size and experiments. Significant levels of infested seed, leads to the conclusion that these seed parasites could be an important reducing factor of generative reproducing host plant potential. The Old World genus Bruchidius Schilsky, 1905 (Coleoptera: Chrysomelidae: Bruchinae), comprises of about 300 species of seed beetles, widespread in the Old World . Some species were introduced with seeds or soil in territories outside their native areal , . For European countries 80 species of the genus were recorded . Bruchidius is the most heterogeneous genus within Bruchinae . Recent investigations of it reveal several phylogenetic groups that are associated with host-plant taxonomic groups . Nevertheless, the genus is not divided into smaller genera, because some species are intermediate concerning morphological characters and bionomic . Most Bruchidius species are reported to feed in the larval stage on the seeds of legumes (Fabaceae), Bruchine chrysomelids are economically important pests of agricultural and stored productsworldwide. Albizia julibrissin Durazz (Fabaceae: Faboideae: Genisteae) and Laburnum anagyroides L. (Leguminosae, Genisteae) both are planted as ornamental trees in Serbia. We studied the seed beetles Bruchidius terrenus (Sharp, 1886) and Bruchidius villosus (Fabricius, 1792), which infest the seeds of A. julibrissin and L. anagyroides, respectively, and their parasitoids, as native entomofauna in progressive adaptation process. Some species are pests due to the losses caused to economically important plants. Laburnum anagyroides Golden chain, or Scotch broom is a densely branched medium shrub (1 - 2 m in its native area), with attractive yellow flowers (16 - 25 mm) that bloom between February and July, depending on the locality. This plant mainly grows on acidic soils, in scrubland accompanying oak, beech and pine woodlands up to 2000 m. It is found in clearings on deep, fresh soil in a large part of western Asia and in Europe across to the Canary Islands, including the entire Iberian Peninsula with the exception of provinces with predominantly limestone soils. It has been accidentally introduced to North and South America, Australia, Hawaii and New Zealand as an ornamental plant , , . Scotch broom is dispersed by seeds that fall roughly 2 m from the parent plant and may be dispersed more widely by other dispersive factors and agents such as ants . Its ballistic seed dispersal mechanism permits a high-potential establishment of new individuals despite its low seed density . Persian silk tree, pink silk tree - Albizia jullibrisin (Durazz., 1772. non sensu Baker, 1876) (Fabales: Fabaceae) are native to Turkey and planted as ornamental trees. It is a popular ornamental tree planted singly, in groups or lining roads throughout Serbia. Also known as “Mimosa”, A. julibrissin origin is from Middle and Eastern Asia. In the last three centuries it was introduced as an ornamental tree in many countries in Europe, North America and Asia due to the beauty of its flowers, fern-like leaves and umbrella-like canopy . L. anagyroides and A. jullibrisin seed pods were collected at the many localities in 2012, 2013 and 2014. Pods were held in the labo-ratory in plastic boxes and transparent bags until the emergence of adult beetles and parasitoids. Each sampled population of pods and/or seeds was put in a bag connected to a clear bottle or tube, following Fursov , and kept under semi-natural room conditions - as it is in the regions where collections were made. Emerging weevils and its parasitoids trapped in the bottles were collected daily for a month and weekly later on until no more adults emerged. Weevil’s adults were identified by external morphological traits. The insect specimens and part of plant specimens were deposited at the Institute of Forestry, Belgrade and Faculty of Forestry, Belgrade. We extensively reviewed the published work for weevils associated with studied host plants and their geographical distribution to study host ranges of the beetles. Ripe pods of A. julibrissin were collected from several isolated trees in October 2013 and from the following several localities in municipality of Ruma, Deteline and Kudos city parts. Additional material was collected in April 2014 from Ruma (Vojvodina). The material was stored in plastic boxes in laboratory conditions. In the periods June - October 2013 and May-June 2014 emergence of adult seed beetles was observed. The level of damage caused by the larvae was established in Northern Serbian population. For this purpose, 300 pods of Mimosa were collected; seeds were extracted and observed for emergence holes. Whole seeds were dissected for estimating if they are infested or not. Bruchids were identified after Borowiec , Hoebeke et al. and Morimoto  and deposited in the author’s collection. 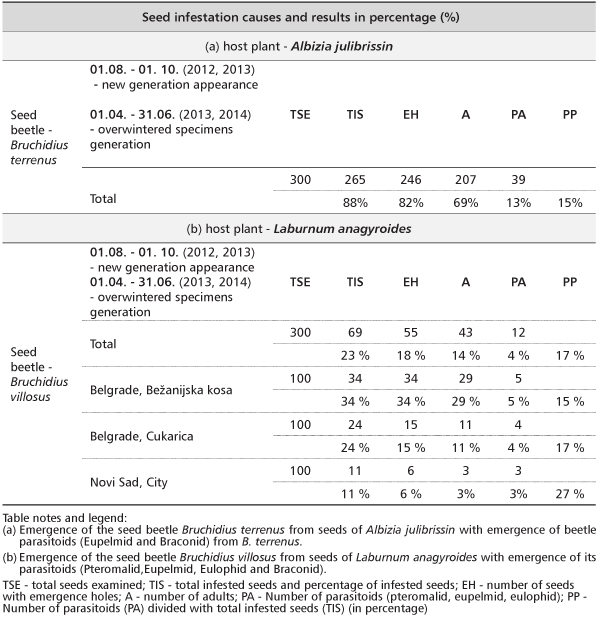 Bruchine beetle specimens had emerged from the seeds of legume host plants (Table 1), and mean level of infested seed explored for the localities in Serbia are present in Tables 1 and 2. There are also data about insect stocks cultures bionomic and life cycle developments collect by seed dissection (100 seed per locality). In the laboratory, weevils and the primary parasitoids were mass-reared in climate controled rooms under conditions close to those of their area of origin: 12:12 L:D , 3-23°C and ≤80% RH (depends on host plant ongoing phenology or experimental needs-proof of weevil monophagous or else feeding preferences). Percentages of total pre-dispersal and post-dispersal (in reinfested material), makes these insects serious host plant suppression candidates. Their bionomic were monitored by continuous infested seed collecting, its disection and observed also in correlation with host specificity ranged from monophagy (at least ecological monophagy) to possible oligophagy. On the basis of presence/absence data we tested the null hypothesis assuming that plant taxa and seed consuming weevil species form congruent phyletic relations at the species level , , , , ,  . For this purpose, pods of L. anagyroides were collected in April 2012 and 2014, than in 2013 during May and August and in April 2014; 300 seeds were also extracted and observed for emergence holes during spring, April, May and June in 2014. Bruchidius terrenus (Sharp, 1886) is native to eastern Palaearctic region, where it is considered as an important pest of A. julibrissin . Morimoto  reported Robinia pseudoacacia (L.) and Acacia confuse Merr. as hosts of B. terrenus too. Recently, B. terrenus was recorded as adventive species in seven southeastern states of USA , . The same authors gave a key for identification of North American Bruchidius species, as well as diagnosis, re-description and seasonal history of B. terrenus. In this paper, B. terrenus is firstly recorded to the Serbian fauna. The level of damage on seeds of host-plant A. julibrissin was investigated in laboratory conditions (Figure 1). Bruchidius villosus (Fabricius, 1792) is first recorded and completely new to Serbian fauna as specialist feeding in seeds of L. anagyroides. We use an indirect method to address the issue of the existence of seed beetles in this popular ornamental and decorative important leguminous woody species in Republic of Serbia. The value of the system lies in the accuracy of host affiliations. Indication of (Fabaceae host plant vs. Bruchine seed predator) – pairs existence, scientifically examined and geographically established, all in numerous previous research, was a lead for insect detection, so their further ecology investigation. Bruchine and their legume hosts were observed by extensive field sam-pling throughout Serbia over three years and by rearing the beetles from the samples in the laboratory. Golden chainas host plants was the subject of pod material sampling . Our findings were recognized as imagoes and larvae, as seed predators – B. villosus and their reared parasitoid complex. The seasonal history and habits of B. terrenus are based mainly on observations by the original collector, supplemented by reference to the biology of B. villosus .Overwintered, sexually immature adults most likely emerge in late spring and disperse to mimosa where they attain sexual maturity by feeding on pollen. In 2013 adults were first found in June while surveying for the beetle. The latest observation of an adult in the field was mid-August 2013. Mimosa trees flower in Serbia from May through August and the fruits (pods) mature from September to November. Oviposition begins when green pods are forming, probably in early July. Pods ripen from late Aug to Nov and begin to disintegrate soon after but remain on the trees into winter. Female’s lay eggs individually (in clusters) on the young pods and cement them in place. Eggs probably hatch in 1-2 weeks, the larvae emerging from the underside of the egg and tunneling into the developing pod. A neonate larva burrows through the pod wall into a soft green seed. Unhatched eggs were still observed on the outside of pods in late July 2013. By mid-August, late instars were found in seeds. During an examination of several trees samples in September 2013, found seeds heavily infested (>80% examined), whereas seeds of these same trees in Sep 2012 were only slightly infested (<5 % examined). Pupation occurs within a seed inside the closed pod. The pupation period probably takes from 10 to 20 days. New generation adults chew through the seed coat and then chew through the pod coat to escape. Adults emerged indoors from early to late Sep from infested pods collected in Ruma (first author’s personal observation). Adult emergence holes were observed on old seed pods collected in early Sep 2013. New adults, after emergence, probably feed on pollen in the fall if flowers are still available. Adults probably overwinter near host trees in plant litter. Based on collecting in 2012 and 2013, adults are found on the host from early to late June to mid-Septembar, so B. terrenus appears to be univoltine in Serbia. The adults of the predispersal B. villosus emerge from seeds of L. anagiroides and probably other overwintering sites such as the sur-face of immature pods. Larvae enter through the pod wall and feed on developing seeds. By mid-August, larvae complete development and pupate, and adults emerge from open pods at the end of August or overwinter within seed of closed pods on the plant. B. vilosus appears to be univoltine, also, in Serbia. The dispersal methods used by host plants lead some predispersive predator insects such as Bruchinae to develop a clear specificity in their host plants. In the case of Fabaceae, there is an insect–plant synchronization of biological cycles in which the end of the larval growth stage coincides with the pod dehiscence, the point when the seeds are ejected some distance from the plant, and with them, the mature larvae or recently formed imagoes (as in the case of the Bruchidius genera, respectively) , , . Their occupation of the seed until its ejection at maturity explains the strategies used by insects to consume resources and at the same time avoid interspecific competition with other predispersive predator insects growing in certain parts of the seed , , . L. anagyroides L. (Leguminosae, Genisteae) is a broom species of European origin introduced both accidentally and as an ornamental plant to Australia, New Zealand and America, where it is classified as a noxious invasive species. One of its main seed pests is B. villosus, a weevil with a Palearctic distribution and which has been introduced to United States and New Zealand as a biological control agent . Factors influencing the insect’s choice of oviposition location are crucial for the plant’s reproductive success . 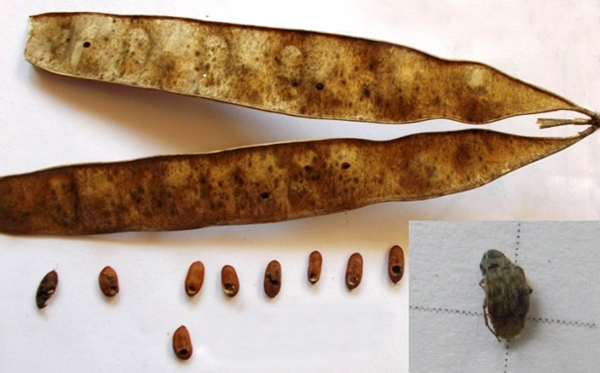 We examined Bruchidius seed predation on the two legume host plants, in the Republic of Serbia, during climate change environmentally close to wide European Mediterranean region conditions. Future experimental and observational studies are needed to clarify the ecology of host utilization and parasitoid accumulation process of effective bio control of the invading legumes that has become a pantropic species (Table 3). Hoebeke et al. reported about 90 % of seeds of some A. julibrissin trees in USA were infested with B. terrenus. We also, found seeds of this plant species heavily infested with B. terrenus – 88% (Table 1), an Asian seed specialist of A. julibrissin that occurs widely in the eastern Palearctic Region, North America, Bulgaria , . According to Stojanova  the presence of its host plant, an appropriate climate, and the absence of natural enemies are conditions favorable for fast and successful invasion by B. terrenus in new territories outside its native range. All this is confirmed by our results opening some new research, such as native parasitoid fauna adaptation to introduced weevil . Nature of this should be tested intensively with a goal of new idioecological relation recognition, biodiversity comparable studies, with special emphasis on new formed intro or interspecies mutualism linkages on Serbian territory. B. terrenus might have been similarly introduced to Serbia with mimosa nursery stock. This seed predator might become a pest of mimosa in landscape plantings and could even be considered a beneficial addition to our fauna by those who regard mimosa as an invasive species and, therefore, an undesirable plant . The study was carried out within the Institute of forestry, Belgrade-Project TP-31070: “The development of technological methods in forestry in order to attain optimal forest cover”, financed by the Republic of Serbia - Ministry of Education and Science. Professor Ljubodrag Mihajlović, PhD, Forest Protection Cathedra, Faculty of Forestry, in Belgrade had determinate insect specimens and provided the experimental and theoretical guidance proposals.